Foofaraw shawlstick pins are designed to bring an affordable "pop" to your knit and crochet wear. What is Foofaraw? It means excessive or flashy ornamentation. At shawlsticks.com, we are all about dressing up! Foofaraws are a jazzy closure for a sweater or vest. Use them to hold your scarf or shawl in place. Try one in the brim of your hat, or the flap of a knit or crocheted purse. I'd love for you to share the ways you are using Foofaraws on Pinterest. Please be sure to check out the How to Wear a Foofaraw page on this website for creative inspiration. You can learn all about Foofaraw on this site, and even more on Pinterest. Retail sales to the general community in the USA is new as of July 2016. There will not be a crossover in styles between the retail and the wholesale shops. I want the thrill of discovering all the possibilities that Foofaraw has to offer to remain special at your Local Yarn Shop. The Wholesale page is password protected. Retail stores requiring the password may email me: info@shawlsticks.com or fill out the contact form. Retail inquires from countries other than the USA are welcome. If you are from Australia, please note that I have closed www.shawlsticks.com.au. 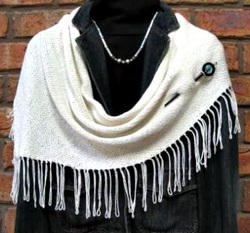 and have moved it to shawlsticks.com under the wholesale tab. Thanks for visiting.